Performance of "SJA" Safe Job Analysis has become more and more in focus. In some instance it may be desirable with an independent analysis of a project. Skailand Kranservice performance these analysis, and delivers a complete description with all calculations. For reference, Skailand Kranservice execute a total description for Hydro at the Sture-port of shipment, outside Bergen. The analysis included both lifting and transporting of the two modulus, containing the first approved ultrasonic metering station in Norway. Each modulus, with weight 65 ton and dimensions 20m x 6m x 4m (lxwxh), had to be lifted with care, to prevent daformation and shock motion. The execution of the installation was carryd out by Vestkran, Bergen. Safety supervisor at Hydro, Sture, Mr. Arne Jagedal, become satisfied with the complete execution of the job. 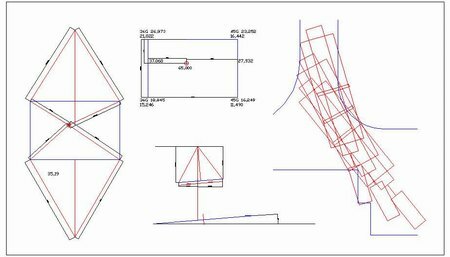 Estimating the stress factor with geometry, after precision measuring of the modulus, and also the theoretical location drawing of the transport of the 2 modulus, all designed in AutoCad 2000. Download a special calculator, and calculate all necessary data for lifting unsymmetrical load's. The calculator requires Microsoft Excel in your PC. The last edition of lifting calculator you may download HERE. It allow you to enter lifting-points in three dimensions (X - Y & Z axis).